I have made the Sunset Magazine Chicken Posole a bunch of times. Never the same way twice but it’s a pretty easy and forgiving recipe and it always turns out great no matter what you put in it. It calls for 3 large poblano chiles. Don’t have those. 3 tablespoons ground red New Mexico chiles. Hrm, don’t have those, either. 3 cups reduced sodium chicken broth. Nope, that neither. OK! Let’s do it anyway. I swirled a little olive oil into a large saucepan and added 1/2 of a large onion, chopped. I cooked it till it was softish, then I added 4 or 5 chicken tenderloins, which I cut into bite sized pieces. I like the flash frozen chicken tenderloins you can get everywhere. I like the tenderloins better than the breasts because they are smaller and more versatile. They cook faster, too. 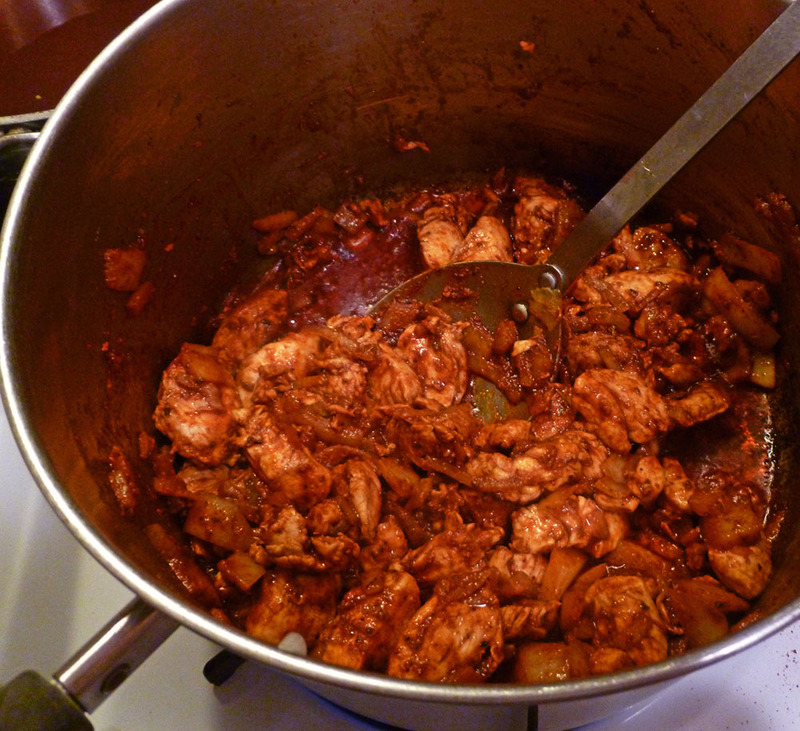 So, then anyhow, I added 1 TBS oregano (I think it actually was Mexican oregano left over from last time I made this) 2 TBS of chili powder and 1 TBS of smoked paprika to the chicken and onion. It looked sooooooo pretty I had to take a picture. After that I added 4 cloves of minced garlic. I like garlic, ok? Plus when you use a garlic press, half of it doesn’t squeeze out anyway. Then I added a 14 oz can of hominy and about 4 cups of broth. I had some suuuuuuuuuuuuper salty homemade beef broth leftover from when I made corned beef last week, so I used some of that and added some homemade chicken broth (no salt added) and then a little water until it was the saltiness level I wanted. See- you can pretty much make this soup with whatever oddball ingredients you have on hand. I brought the whole thing to a boil then let it simmer awhile. The original recipe says to simmer it for 10 minutes which I’m sure would be sufficient. I don’t know how long mine simmered. A long time, tho. Eventually I realized it was going to be too thin and watery so I found some rice (maybe 1/4 cup or so?) in the cupboard and tossed that in there. It cooked up really nicely- I might include it next time I make this if I have any. 30 minutes or so later it still seemed a little thin so I added a few TBS of cornmeal and let it cook some more, which thickened it up nicely. Remember if you’re ever making a Mexicanish or Southwesternish or even Italianish soup or stew or chili and it seems too thin, you can always add a little cornmeal to thicken it up. Not too much, tho, or it can get too thick! Start with just a little and let it cook 10 minutes or so before adding more if you think it needs it. 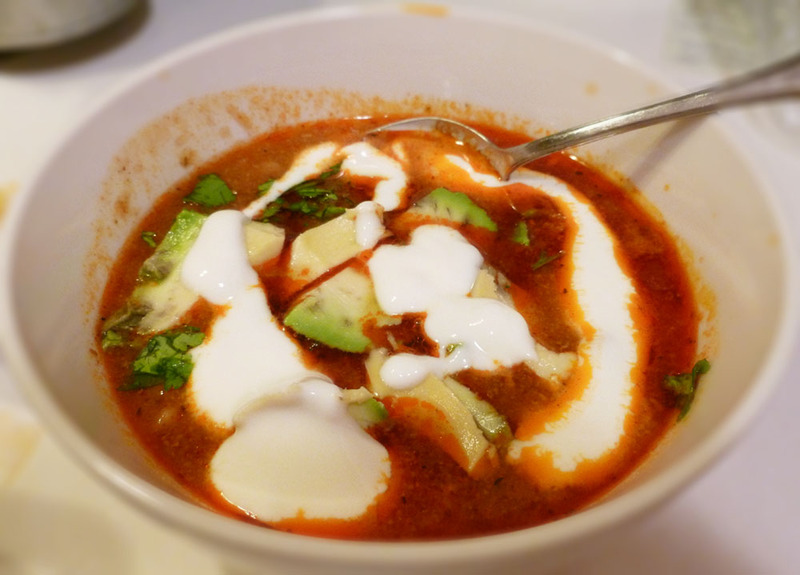 I served the soup with some plain yogurt, chopped cilantro, and avocado. It was really good! All that long simmering made the chicken really tender, which made me think it would be delicious in the traditional way, made with pork. Or you could even use beef. Use whatever you have. The important ingredients are the onion, chili spices, and the hominy. Everything else is up for interpretation. Let me know if you make this and how you did it!